You may contact George Cook and AAreports by email at georgelcookiii@gmail.com or by phone at 908 963 3824. 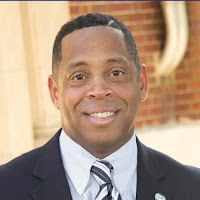 Site owner George L. Cook III is married with one child who believes that education is the way to the help the Black Community not only survive but thrive. Mr. Cook also believes that one can not sit on the sidelines and think that others will make things better for our communities. Early on he volunteered as a coach and then later became involved politically. In 2017 he was elected to the Hillside NJ town council. He served as a member of his local board of education from 2009-2017. George Cook and family at 2018 Swearing in to town council. 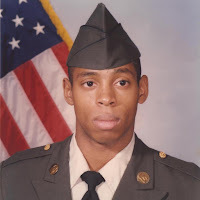 Member NJ National Gaurd 1991-1994. 2004 wrote first book Let's Talk Honestly and launched the web site letstalkhonestly.com which lasted until May 2010. 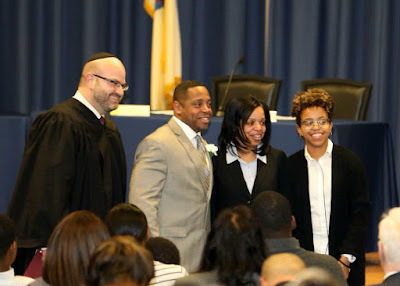 Appointed to Hillside NJ Board of Education in June 0f 2009. 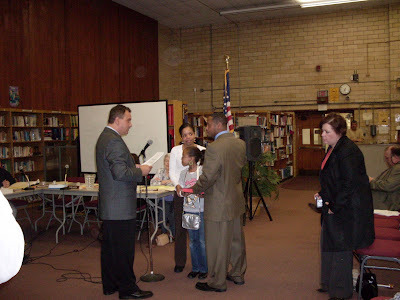 Won election to keep BOE seat in April of 2010, named vice president of The Hillside Board of Education. Below is a picture of Mr. Cook's swearing in on April 26, 2010. On May 2, 2011 George Cook was elected President of the Hillside Board of Education. Served in that capacity until 2014. Elected to New Jersey School Boards Board of Directors in 2015. Re-elected to Board of Education in 2016. Elected to town council 2017.Term expires 2021.